I wanted to find some way to throw some special attention onto the show the day before it gets underway. At the moment this rolls out, it's likely that the convention's vans are shuttling back and forth between airport and the downtown Westin that will serve as informal hub and all around drink-and-talk central. I asked cartoonist Dustin Harbin, who used to be formally aligned with the show, to whom I might speak. He suggested Rico Renzi, someone with whom I'm familiar as a colorist rather than as convention support staff. I'm grateful he was able to find the time in a busy, busy week. TOM SPURGEON: Can you describe by way of introduction what it is you're actually doing for the show? Because I think as much as readers of CR are familiar with how things work at HeroesCon, they're familiar with how they worked when Dustin Harbin was running things. 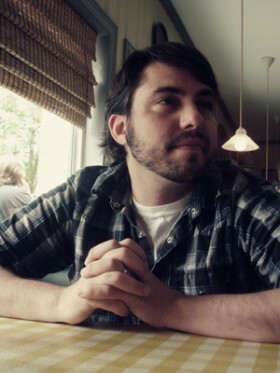 RICO RENZI: Well, when Dustin resigned, Casey Jones, a mutual friend of Shelton and I, gave me a call and suggested I might be a good fit in the Creative Director role. After a few months of phone tag and negotiations, I packed up my wife and daughter and we moved down here from the Baltimore area. I was hired as Creative Director but within a couple months of starting, our Events Coordinator resigned so I had to take on a few more responsibilities. I've attended HeroesCon many times as a fan and guest since 1997 and it has always been my favorite con since that first visit. I'm not trying to reinvent anything here, Shelton has a great thing going and I'm just here to help continue that friendly, comics, and art-focused tradition. If you want a difference between Dusty's methods and mine, I'm not as comfortable being in the spotlight. Shelton is the face of HeroesCon and he's great at that. SPURGEON: I'm aware of some of your color work... how much is comics work a part of your overall vocational profile? Does that help, at all, do you think, having that perspective when dealing with what pros and the like want out of a comics show? RENZI: I'm usually working on about three coloring jobs at any given time. I work on that stuff after I get home from a day of work at Heroes and after we have dinner and put my 7-year old to bed. My comics career and past life in the printing industry prepared me for most of what I deal with on a day-to-day basis at Heroes. I'm familiar with most of the guests so I do my best to arrange the floor so that creators are either sitting next to their friends or someone I think they will have a lot in common with. If all your guests are happy it will do wonders for the atmosphere of the show and how attendees perceive you convention. So yes, I think it helps! SPURGEON: Heroes has this wonderful and I think deserved reputation as a big art show, a show where the fans and the pros in attendance are maybe a little bit more into original art and buying sketches than the average show. There's also the big art auction. Do you have any idea how Heroes developed this particular aspect of the convention experience? Are there artists at the show that you particularly look forward to seeing? RENZI: I've always thought of Heroes as a comic art show but working here I've learned about some the other aspects of it like the great panel discussions Andy Mansell helps coordinate. The Discussion Groups that he organizes for the store throughout the year are amazing too. Andy isn't even on staff, he's a volunteer! The Annual Art Auction and the availability of the artists to their fans was what made HeroesCon unique to me. I first came here as a sketch hound and got amazing art from guys like Adam Hughes and Brian Stelfreeze for the price of a steak dinner! The auction was originally a charity event. After a few years though, several of guests of the show saw that Shelton [Drum, the show's founder and owner of the Heroes retail operation] was putting the show on at a loss and asked him to consider rolling the auction proceeds back into the convention's hospitality fund. So, it's kind of like a self-contained convention Kickstarter. The generosity of our guests is what keeps us afloat and allows us to put on a comic book show without having a bunch of movie and videogame companies here. Artists I look forward to seeing? Bill Sienkiewicz is coming to the show this year and watching that guy paint is awesome! He attacks the board with utter confidence and creates something gorgeous every time. 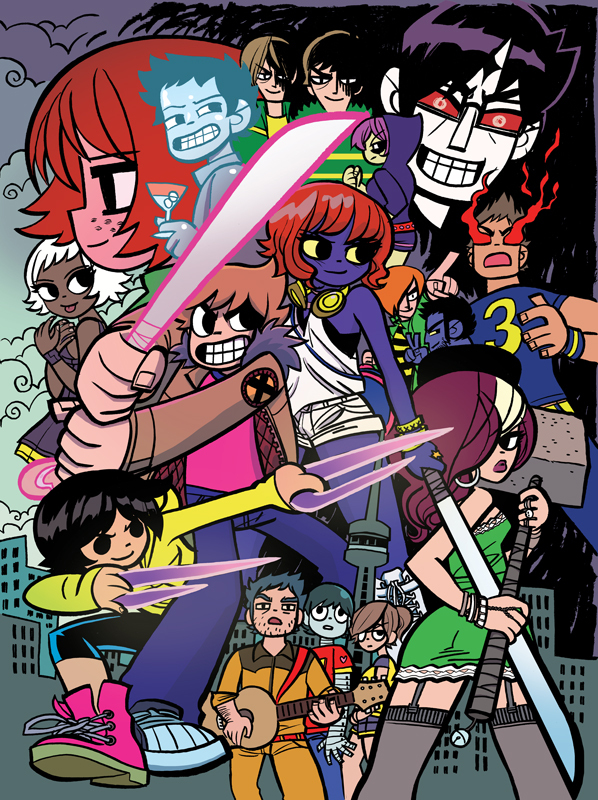 Dave Cooper and Jaime Hernandez would have to be the guests I am most excited about, though. They are truly two of my favorite artists. Dave's never been to HeroesCon, I'm hoping he has a great time and starts getting the itch to make comics again! SPURGEON: Does Heroes have goals and the like that it tries to meet in a specific year? Like I remember attending in 2010, and they had moved halls since the previous time I'd been there, and that seemed like a big deal to me. 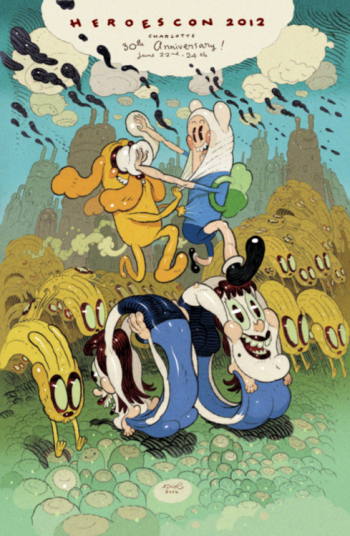 Is the show as healthy and generally successful as it seems like from the outside-in? Where are there improvements to be made, development to be had? RENZI: Stan Lee's attendance to this year's show has definitely caused a spike in advance ticket sales from what I can tell. I honestly like the show at just the size it is; it's just right. I used to hop on a bus from Baltimore to go the NYCC and I loved it for the first couple years. It just got too big for me too enjoy it, you couldn't walk around without rubbing up against strangers. It's a great alternative to San Diego now I guess. If you're looking for a pure comic book show though, HeroesCon is where it's at. We're been trying a few new things between this year and last year. On Friday night we have a Drink and Draw event across from the convention center where creators draw on coasters and we sell them to benefit Richard Thompson and Chris Sparks' Team Cul de Sac efforts on behalf of Parkinson's Research. This year we're going to attempt our first HeroesCon Fun Run. Eric Canete spearheaded it and did artwork for our shirt. He even offered to do portfolio reviews of any aspiring artists who participate! SPURGEON: You guys have a reputation as a premier regional show... one for which guests and pros have a lot of affection. I know that a number of shows are kind of getting to a similar point in their development. Is ther any advice you'd have for show that would like a similar, solid place in the convention calendar? Is there something that smaller shows overlook as they grow, do you think? RENZI: I think Shelton has done a great job of branding his convention. It's known for specific things. To me it's art and hospitality. Smaller conventions skimp on design, someone who knows how to use Photoshop or Powerpoint designs their postcards and their websites. Their logos change each time they put out a new postcard! I'd say sit down and think about what you want to project, hire a designer, invite a few great guests and build a relationship with them and your attendees. Then find your niche. SPURGEON: We talked about guests, and you mentioned Dave and Jaime, who are two astounding artists -- are there other guys that you want to see, maybe someone with whom you have a relationship tied to show? I know that when conventions work they all seem to work that way, where you're not just seeing artists you admire but also seeing guys with whom you have a relationship based on the show itself or getting to spend the weekend with some pals with whom you share comics or other comics endeavors. RENZI: Definitely excited to meet Mike Zeck! He was one of the guys at the first HeroesCon. My buddy Chris Brunner who I do Loose Ends with is coming up from Atlanta, it's always great to hang out with him. SPURGEON: Do you even have hang out time? How much of the show do you get to attend, Rico? RENZI: I attend the entire show, Tom; I speed walk that floor from open until close everyday, putting out fires and making sure everyone is having a great time. I'm looking forward to Saturday afternoon right now so I can exhale. 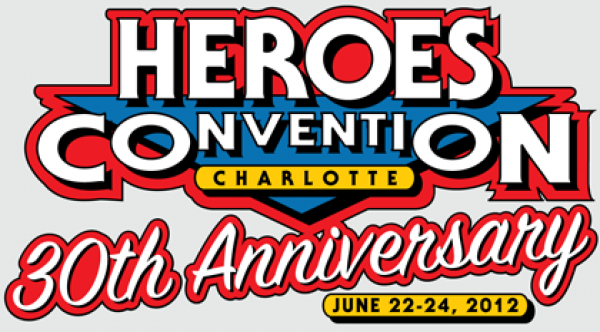 HeroesCon is Friday, Saturday, Sunday at the Charlotte Convention Center. It's a good thing about comics, and I hope if you can, you'll attend.